The accumulation of lipids within arteries remains to be the initial impulse for the pathogenesis of atherosclerosis ; however, both inflammation and oxidative stress are considered to play a critical role in this process. Several lipid-lowering drugs, such as statins , are used as the first-line therapy in hypercholesterolemia . Statin monotherapy is generally well tolerated; however, a low frequency occurrence of myopathy and asymptomatic increase in hepatic transaminases have been reported. In addition, since statins are prescribed on a long-term basis, drug–drug interactions are possible, and their possible interactions with other drugs deserve particular attention, as many patients will typically receive pharmacological therapy for concomitant conditions during the course of statin treatments. Furthermore, with the success of statins in both primary and secondary prevention of cardiovascular morbidity and mortality, their use is progressively increasing, especially among older Americans. With such widespread use, even small risks are apparent alongside benefits. One emerging risk is an increased incidence of diabetes mellitus (DM). There is evidence that incident DM associated with statin use may be more common in the elderly, in women, and in Asians. A recent analysis suggests that preexisting metabolic risk factors control incident DM rate with statin medication. On the other hand, the use of herbal and medicinal plant products has gained popularity as preventive or therapeutic agents for cardiovascular disease (CVD). Herbal supplements have been used for medicinal purposes for thousands of years in the East, particularly the Indian Ayurvedic system and the traditional Chinese medicine , and have recently become popular among consumers in the west. Ayurveda, of which yoga is an integral part, is widely practiced in India and is gaining acceptance in many countries around the world. It is a comprehensive and a holistic system, the focus of which is on the body, mind, and consciousness. The Ayurvedic treatment consists of the use herbal preparations, diet, yoga, meditation, and other practices: many herbs used by Ayurvedic practitioners show promise and could be appropriate for larger randomized trials. Herbal medicines including traditional Chinese and Ayurvedic medicines are also considered to be cost-effective in the management of disease and this alternative form of medical practice is known to play an important role in health maintenance: for example in the current therapies for diabetes are included lifestyle modification, drugs to lower conventional cardiovascular risk factors (such as metformin , thiazolindinedione , sulfonylureas and evidence-based drugs) , but a large body of clinical evidence has suggested that the appropriate use of traditional Chinese medicines can prevent or ameliorate the development of diabetic complications. Since elevated levels of plasma total cholesterol, LDL cholesterol (LDL-C), triglycerides (TGs) and glucose are well-known risk factors for coronary artery disease (CAD), we will focus on some of the alternative therapies for improving blood lipid profile and glucose levels, and we will also discuss the possible antioxidants, hypoglycemic and hypolipidemic effects of functional foods, herbal products and medicinal plants. Although these alternative therapies are gaining popularity, several issues regarding safety and efficacy of herbal medicines remain to be addressed. Those therapies are based on the availability of clinical evidence on efficacy, with improvements in the plasma profiles of total cholesterol, HDL cholesterol (HDL-C), LDL -C (native and oxidized forms), as well as glucose-lowering and antioxidant effects. These natural products deserve further work to isolate and characterize their constituents for the development of novel and more effective agents. A consideration for acupuncture, as well as yoga, is also presented as emerging alternative approaches in preventing/treating Cardiovascular Disease. Red yeast rice is a bright reddish purple fermented rice, which acquires its colour from being cultivated with the mold Monascus purpureus and is served as a dietary staple in some Asian countries. 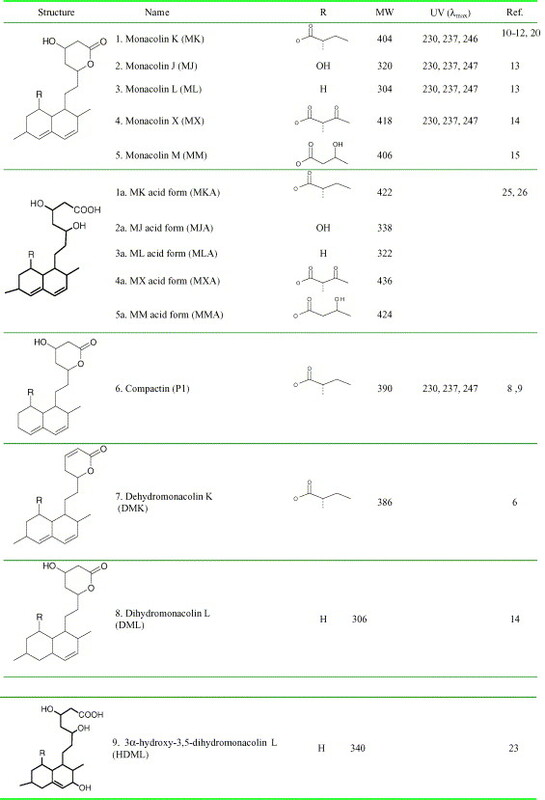 It contains several compounds collectively known as monacolins: monacolins have been proved to be main active constituents, known to inhibit HMG-CoA reductase (the rate-limiting enzyme in cholesterol biosynthesis). In total 14 monacolin compounds such as monacolin K (mevinolin), J , L , M, X, and their hydroxy acid form, as well as dehydromonacolin K, dihydromonacolin L, compactin, 3alpha-hydroxy-3,5-dihydromonacolin L, etc. were identified in red yeast rice. Those substances are also known as “mevinolin or lovastatin (Mevacor®; Merck & Co., Inc., NJ, USA). Several clinical trials have reported that red yeast rice or its extracts ( Xuezhikang ) exert hypolipidemic effects. In this regard, studies showed that RYR (Red Yeast rice) significantly lowered LDL cholesterol and total cholesterol: compared with statins, RYR was shown to have an equal efficacy to statins when combined with or without other dietary supplements. RYR also appeared to be superior to placebo in preventing nonfatal myocardial infarction, total coronary heart disease events, and total deaths. It has been reported that a pill composed of 200 mg red yeast rice, 0.2 mg folic acid , 2 mg coenzyme Q10 and 0.5 mg astaxanthin reduced total cholesterol (20%), LDL-C (31%) and insulin resistance (10%) in 106 dyslipidemic patients after a 12-month treatment. Other research have reported that a combination of red yeast rice, bitter gourd , chlorella , soy protein and licorice extracts significantly decreased total cholesterol, LDL-C and TG levels in patients with metabolic syndrome following a 12-week treatment period. Some beverages containing red yeast rice have also been studied in multicenter clinical trials in patients with dyslipidemia: a beverage containing red yeast rice significantly reduced total cholesterol (14%) and LDL-C (17%) after an 8-week treatment in 59 subjects with dyslipidemia. Thus, from these studies, it appears that red yeast rice is able to lower total cholesterol and LDL-C levels in patients with abnormal lipid profiles: RYR can be a safe and effective natural alternative to pharmacologic therapies for people intolerant to or refusing statins but still in need of achieving and maintaining a healthy and low cholesterol level. Allium sativum, commonly known as garlic, is a species in the onion genus, Allium. It is a staple in the Mediterranean region and is a frequently used seasoning in Asia, Africa and Europe. The cholesterol-lowering effects of garlic powder ( Allicor ) have been examined in a number of clinical trials in patients with hypercholesterolemia, CHD, diabetes and other CVDs. In a double-blinded, placebo-controlled, randomized study conducted in 51 patients with CHD, Igor A. Sobenin have demonstrated that a 12-month treatment with Allicor results in the significant decrease of cardiovascular risk by 1.5-fold in men, and by 1.3-fold in women. The main effect that played a role in cardiovascular risk reduction was the decrease in LDL cholesterol by 32.9 mg/dl in men, and by 27.3 mg/dl in women. Thus, the most significant effects were observed in men, while in women the decrease of cardiovascular risk appeared as a trend that might be due presumably to the insufficient sample size. In another study, the lipid-lowering effects of time-released allicor tablets (600 mg daily) were investigated in a double-blinded, placebo-controlled, randomized study in 42 men aged 35–70 years with mild hypercholesterolemia. Allicor treatment resulted in a moderate but statistically significant decrease in total cholesterol level that was observed after 8 and 12 weeks of active treatment. By the end of the study, total cholesterol in Allicor-treated patients had fallen by 7.6% (p=0.004) as compared to the level at randomization, and was 11.5% lower than the placebo group (p=0.005). LDL cholesterol in Allicor-treated patients fell by 11.8% (p=0.002) and 13.8% (p=0.009), respectively. HDL cholesterol also increased significantly after 8 and 12 weeks of treatment. By the end of the study, HDL cholesterol in Allicor-treated patients had increased by 11.5% (p=0.013). The obtained results are in good agreement with trials that have demonstrated the cardioprotective action of garlic preparations and may be due to the use of a time-released form of garlic powder tablets that provides a prolonged biological effect. The effects of allicor on the risk of ischemic heart disease (IHD, same as CAD) in primary prophylaxis of CVDs have been examined. In a double-blind, placebo-controlled study involving 167 patients with hyperlipidemia free of IHD, it was found that a 12-month intervention resulted in a 10.7% reduction of a 10-year absolute risk to develop IHD and decreased a 10-year absolute risk of acute myocardial infarction and sudden death by 22.7% in men. In women, allicor prevented age-related cardiovascular risk. Among lipid parameters, the greatest fall was observed for total cholesterol and LDL-C in men by 27.9 and 22.5 mg/dl, and in women by 11.4 and 10.8 mg/dl, respectively. The efficacy of allicor has also been examined in Type 2 diabetic subjects. It is well known that diabetes is associated with accelerated development of atherosclerosis. In a 4-week, double-blinded, placebo-controlled study in 60 Type 2 diabetic patients, it was demonstrated that treatment with allicor resulted in improved metabolic control due to the lowering of fasting blood glucose , serum fructosamine and serum TG levels . The authors concluded that the benefits from garlic preparations may lead to the reduction of cardiovascular risk in diabetic patients. Since allicor is the remedy of natural origin, it is safe with respect to adverse effects. With respect to the safe use of garlic, it has been consumed for several thousand years without any adverse long-term effects, suggesting modest quantities of garlic, at worst, may produce minimal risks to normal individuals. Possible side effects include gastrointestinal discomfort, sweating, dizziness, allergic reactions and menstrual irregularities. Rhubarb ( Rheum rhapontiam) is usually considered to be a vegetable, but in the USA, it is considered as a fruit. A cholesterol-lowering effect in hypercholesterolemic men has been reported. In this study, ten hypercholesterolemic men were given 27 g/day of ground rhubarb stalk fiber for 4 weeks. Rhubarb fiber supplementation resulted in significant lowering of serum total cholesterol (8%) and low-density lipoprotein cholesterol (9%), while high-density lipoprotein cholesterol (HDL) concentrations remained unchanged. The depressed total and LDL cholesterol levels returned to baseline after the fiber supplementation was withdrawn for 1 month. The rhubarb stalk fiber is effective in lowering serum cholesterol concentrations, especially LDL cholesterol, in hypercholesterolemic men. These results signify the potential use of underutilized rhubarb crop. However, further clinical trials are required. Although rhubarb leaves contain oxalic acid , which is a nephrotoxic, very low amounts are seen in the raw stalks and thus may not be a safety concern. Licorice root (Glycyrrhiza glabra) is an Ayurvedic medicinal plant used in India to treat several ailments. A few clinical studies have evaluated the potential effects of licorice root in humans. In a double-blinded study, adult subjects with metabolic syndrome were randomized to receive plant extracts or placebo treatment for 12 weeks. Both total cholesterol and LDL-C were significantly reduced after treatment with the plant extracts. The reduction in fasting TG level was significantly greater in the plant-extract group than in the placebo group. There was also a significantly greater reduction in the blood pressure of subjects with hypertension in the plant-extract group than in the placebo group. However, this study was conducted with a combination of extracts from red yeast rice, bitter gourd, chlorella, soy protein and licorice roots (as seen before). Nonetheless, this combination was effective in reducing total cholesterol and LDL-C, as well as reducing TG and normalizing blood pressure. The potential of licorice extract as an antiatherosclerotic agent has been further examined in hypercholesterolemic patients. In this study, supplementation of licorice root extract (0.1 g/day) was given to patients for one month. After 1 month of licorice-root ethanolic extract consumption, a small (7%) but significant (P < 0.01) reduction in serum glucose and a 10% reduction in serum amylase concentrations were observed after licorice consumption . After the 1-month placebo treatment, serum glucose and amylase levels returned to baseline values. They next analyzed the effect of licorice-extract consumption on serum lipid profiles in the hypercholesterolemic patients: serum cholesterol levels were minimally (5%) but significantly (P < 0.01) reduced after licorice consumption as a result of a 9% reduction in LDL cholesterol. Those effects were not sustained beyond the treatment period; after 1 month of placebo treatment, serum and LDL cholesterol levels returned to baseline levels. * Serum triacylglycerol concentrations decreased* by 13% after licorice consumption, as reflected by a significant (P < 0.01) reduction of 14% in serum VLDL levels. Also blood pressure measurements showed a significant (P < 0.01) 10% reduction in systolic blood pressure, with no significant effect on the diastolic blood pressure. After the 1-month placebo treatment, the decrease in systolic blood pressure remained compared with baseline levels. Retention of LDL, which is an early step in atherogenesis, was measured by analysis of LDL binding to the proteoglycan CS . After licorice consumption, LDL CS binding ability decreased significantly (P < 0.01) by 25%. These data show that consumption of licorice extract may prove beneficial in its ability to attenuate the accelerated development of atherosclerosis in hypercholesterolemic patients. Licorice-root extract consumption was associated with reduced atherogenic modifications of LDL, including reduced oxidation, reduced CS binding ability (retention) and aggregation, reduced plasma lipid levels, and reduced systolic blood pressure. It is well known that overactivity of the sympathetic nervous system and psychological stress can influence blood lipid and glucose levels: the effects of behaviour modification through education and relaxation-meditation on the levels of blood pressure, pulse rate, smoking habits as well as serum cholesterol, triglycerides, and free fatty acids were studied in 18 normotensive, 18 smoking, and 22 hypertensive patients with 18 normotensive controls. The results showed significant reduction in blood pressure, in all the treated groups; highly significant reduction in the number of cigarettes smoked by smokers; and reduction in some of the lipids in all the treated groups, but particularly in the hypertensive group. The therapy appears to be feasible and suitable for wider application: this approach is economical, acceptable to patients, and should be explored further. In a yoga clinical trial twenty volunteers with body mass index (BMI) greater than the 95th percentile were randomly assigned to yoga (age 14.7±0.5 years, n=10) and control groups (age 14.6±1.0 years, n=10). The yoga group performed exercises three times per week at 40~60% of heart-rate reserve (HRR) for 8 weeks. After yoga training, body weight, BMI, fat mass (FM), and body fat (BF ) were significantly decreased, and fat-free mass and basal metabolic rate were significantly increased than baseline values. FM and BF % were significantly improved in the yoga group compared with the control group (p<0.05). Total cholesterol (TC) was significantly decreased in the yoga group (p<0.01).These findings show that an 8-week of yoga training improves body composition and TC levels in obese adolescent boys, suggesting that yoga training may be effective in controlling some metabolic syndrome factors in obese adolescent boys. These findings were supported by the results from Bijilani et al, which reported that total cholesterol, fasting plasma glucose and LDL-C were lowered , while HDL was significantly elevated in subjects who had undertaken yoga. In another clinical trial conducted by Schmidt et al., it was reported that 3 months of yoga and meditation significantly reduced total cholesterol and LDL-C levels, as well as reducing BMI and blood pressure. In addition, a 3-month yoga intervention has been demonstrated to reduce oxidative stress and improve glycemic control in Type 2 diabetic patients. Of note, no adverse events were reported. From the evidence provided, it would appear that yoga and other forms of meditation could be of value as a component of a lifestyle change to improve lipid profiles and to reduce the risk of CVD. However, further trials are needed. We have to raise awareness of the potential of a variety of natural products, as well as alternative approaches that include yoga and acupuncture, for possible control, management and prevention of CVD and associated risk factors. From the evidence provided, it would appear that many herbal medicines are effective in improving blood lipid and glucose levels, as well as reducing lipid oxidation. Safety profiles from clinical trials appear promising, but the long-term safety and efficacy need to be established for these products. Although preliminary clinical trials seem promising, large, multicenter, randomized controlled trials are needed to determine efficacy and long-term safety. Indeed, further research is warranted before the use of herbal medicines can be deemed acceptable to modern medicine. In view of the increasing use of herbal products, there is a risk for adverse herb–drug interactions, particularly in those patient populations that consume multiple prescription medicines for comorbid conditions and thus more work is needed to understand this relationship and risk. The underlying mechanisms of beneficial action of herbal medicines also require further research and investment such that highly effective and novel therapeutics for CVD can be developed. The general public tends to view herbal products as natural, but there is also a clear need for better public and physician understanding of the potential of herbal products. Clinicians themselves need to be more involved in the research and evaluation of herbal medicines in order to completely accept their use as part of medical practice. Some perspectives for future research are also suggested and include the identification of actual bioactive components of functional foods and herbal products, as well as the investigation of their mechanisms of actions.